Do you know a Fort Valley State University (FVSU) alumna or alumnus who deserves special recognition? The true measure of a university’s greatness can be found in the achievements of its alumni. 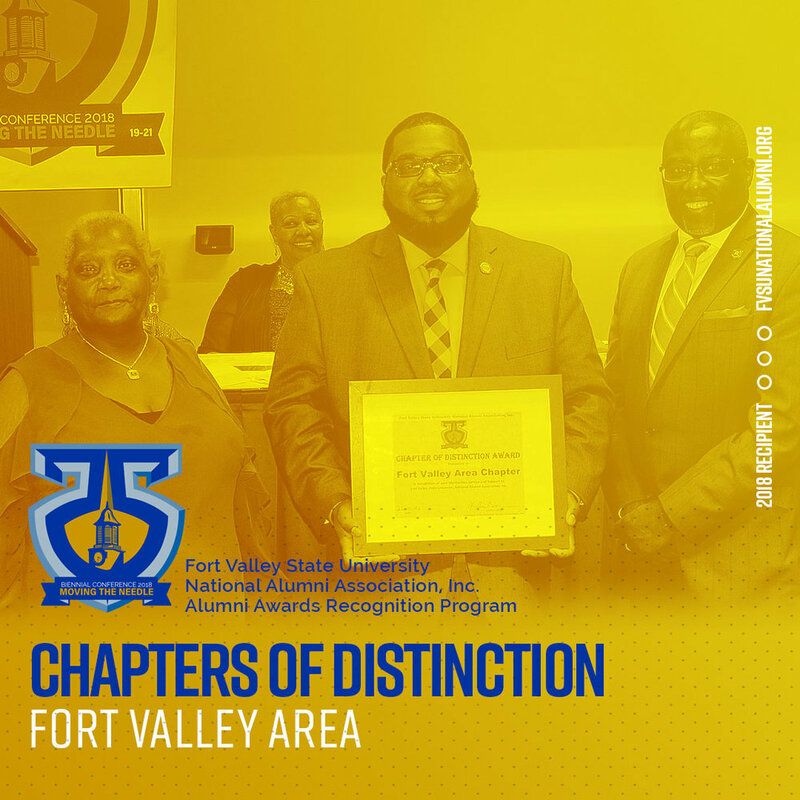 Fort Valley State University National Alumni Association, Inc. (FVSUNAA) is proud to recognize our alumni for their outstanding accomplishments and achievements. The purpose is to introduce the Alumni Awards Recognition Program (AARP) which is designed to recognize and thank individual alumni and chapters for their contributions, dedication, and commitment to FVSUNAA, Inc. and the University. It is our hope that this program will increase alumni engagement by recognizing and awarding chapters and individuals for extraordinary service and leadership to the university and alumni association and for the support and positive impact alumni continue to provide throughout the state and nation. Please help us honor the notable achievements and contributions that FVSU alumni are making to the University, in the Association, community and across the nation by nominating them for the following awards and recognitions. 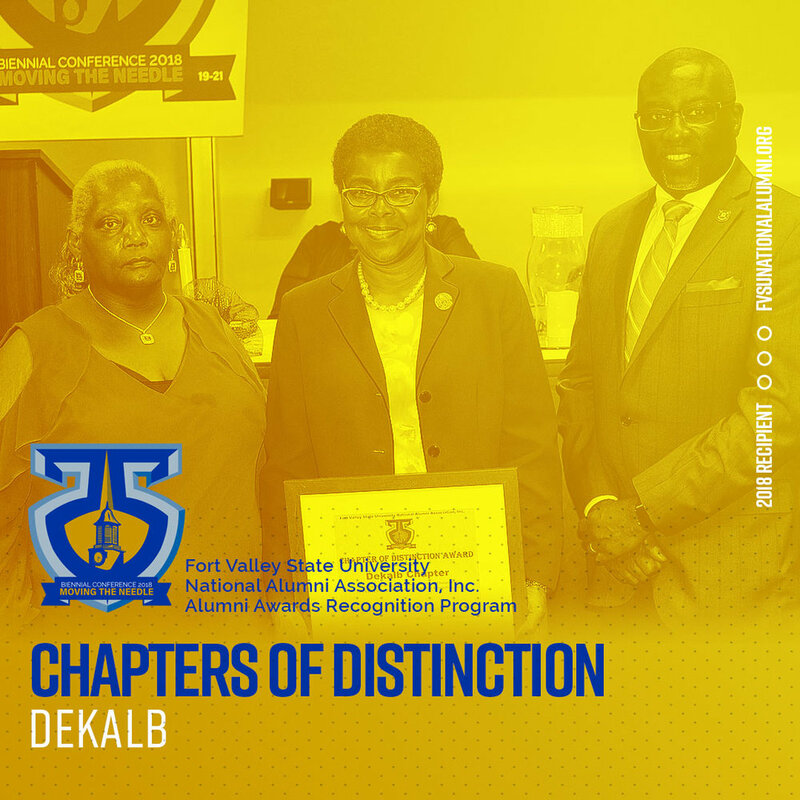 This award will be presented annually to a chapter that has demonstrated extraordinary initiative and innovation in bringing area alumni together to provide support for FVSU. This award is given to a chapter, rather than an individual, and as such places a special emphasis on teamwork. The recipient must be an alumni chapter recognized by the Fort Valley State University National Alumni Association, Incorporated. The chapter must be in good financial standing, having paid their annual chapter assessment and Hunt-Bond-Troup assessment, both are due at the beginning of the year. The chapter must have shown innovation and initiative in one or more of the following areas: programming, recruiting new students and alumni members, engaging area alumni and fundraising. The chapter should submit proof of recruitment events held by them or in support of FVSU’s recruitment efforts. This includes Open House, Back-to-School events, Wildcat Nights, etc. The chapter must show an increase in membership by at least 10% of its total membership as of the end of the most recent (preceding) calendar year. The chapter must participate in a community service program and show proof of participation. The chapter must have a robust social media and/or public relations program to recruit students and alumni and provide information to the public-at-large. The chapter must provide financial support to students at FVSU via scholarships. Please indicate in the application the number of scholarships and/or dollar amount provided in support of scholarships. If the monies are not sent directly to FVSU for disbursement, please provide proof of financial support. Financial support to FVSU by at least three (3) individual members of the chapter to academics, athletics and/or band will be considered as support to the FVSU Alumni Association’s Giving Initiative for which those chapters will receive additional consideration. 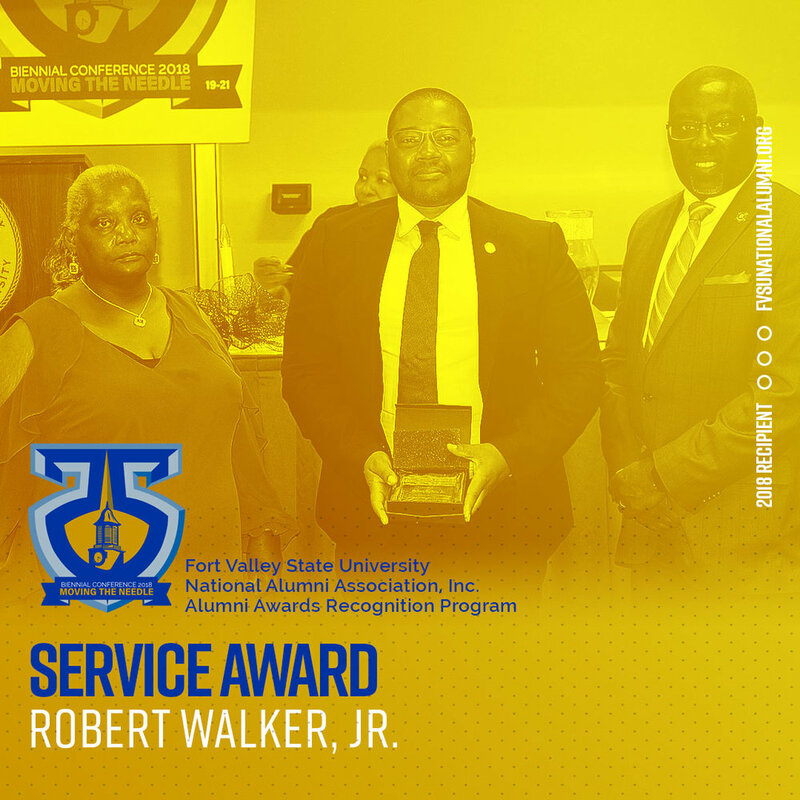 Exceptional service in support of the advancement and continued excellence of FVSU. Did the nominee achieve an exceptional level of service while balancing the demands of being a recent graduate? Was the candidate proactive in efforts to become involved in alumni activities? If not, has the service been strikingly innovative or substantially beneficial? Rendered significant service to the University, to the FVSU National Alumni Association, Inc., and to the local chapter as outlined below. (Service may be verified by the Awards Committee). Provide details (date and location) of active involvement in fundraising projects for the local chapter, FVSUNAA, Inc. or FVSU. The Distinguished Alumni Service Award recognizes alumni who have distinguished themselves in service to their communities and the university in ways far exceeding traditional business, professional, and civic duties. They have made significant contributions of time and/or philanthropy to the university, Association or their community. This award recognizes outstanding achievement and/or leadership demonstrated by the recipients in their chosen fields of interest or to the University or Association over an extended period of time. This award is designed to publicly acknowledge those individuals or chapters who have volunteered significant amounts of time, talents and resources to the University or the Association. This award honors an alumnus/alumna who through service, leadership and achievement has distinguished him/herself at the University or Association and the community at large. The recipient should, through the quality of his/her life, spirit and service, exemplify the ideals of the FVSUNAA, Inc. mission; a commitment to service; the pursuit of professional integrity and demonstrated work and accomplishments to honor the University, the Association, and the greater community. The recipient must be an active financial alumni member of a local chapter (if one exists) or on the national level. The Distinguished Alumni Service Award recognizes individuals who have distinguished themselves in service to their communities and the University in ways far exceeding traditional business, professional, and civic duties. 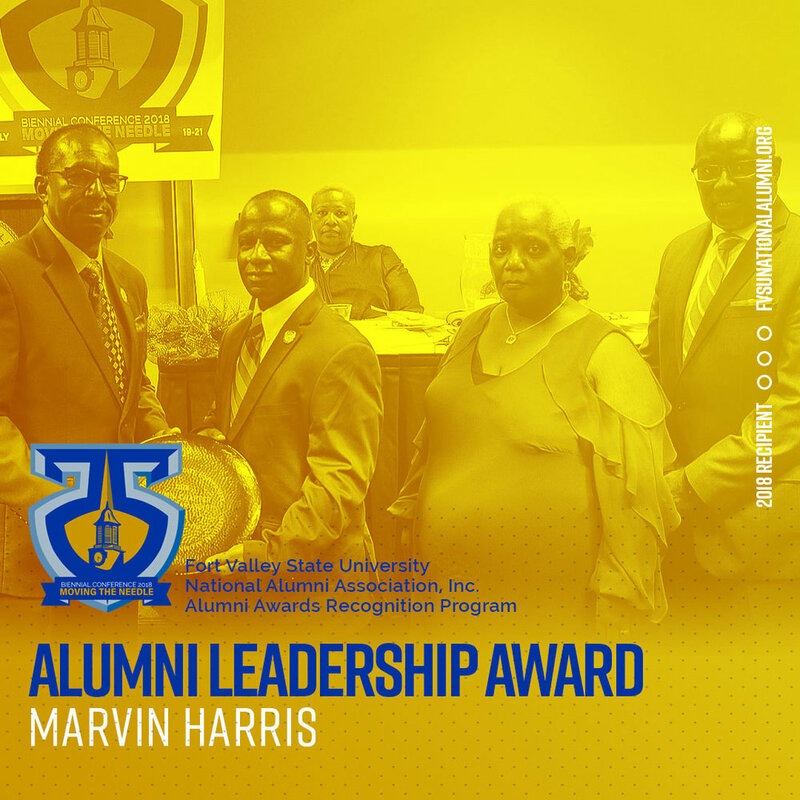 The recipient of this award does not have to be a FVSU alumnus. Nominee must have made significant contributions of time and/or philanthropy to the University, Association or their community. This award recognizes outstanding achievement and/or leadership demonstrated by the recipient(s) in their chosen fields of interest or to the University or Association over an extended period of time. This award is designed to publicly acknowledge those individuals who have volunteered significant amounts of time, talents and resources to the University or the Association. This award honors an alumnus/alumna who through service, leadership and achievement has distinguished him/herself at the University or Association and the community at large. The recipient should, through the quality of his/her life, spirit and service, exemplify the ideals of the FVSUNAA, Inc. mission; a commitment to service; the pursuit of professional integrity and demonstrated work and accomplishments to honor the University, the Association, and the greater community. Recognize alumni who volunteer for leadership roles on alumni events and programs. 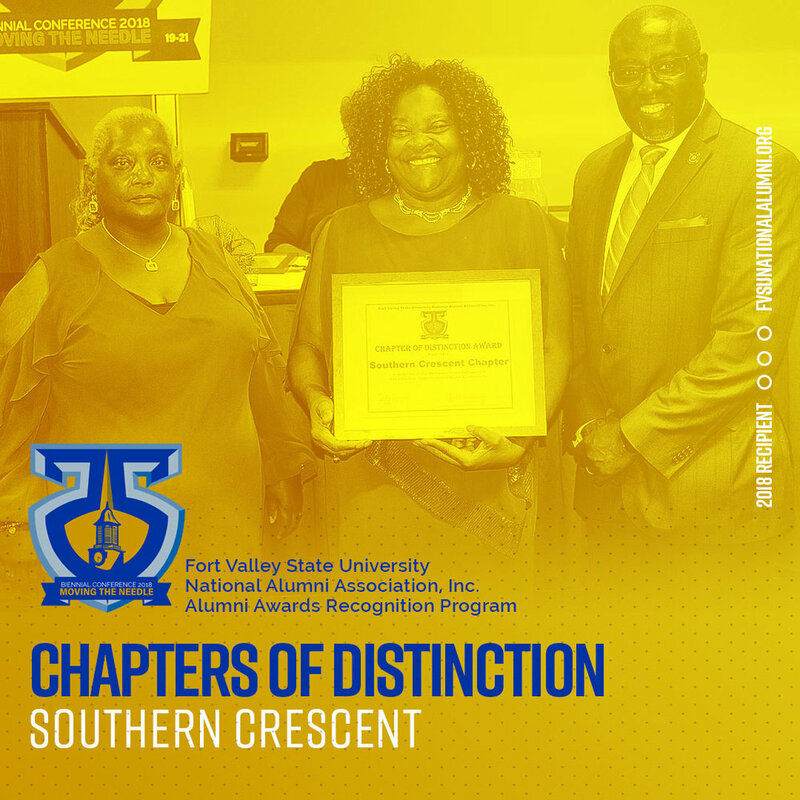 The Chapters of Distinction Award is reserved for those chapters that support the mission of the FVSUNAA, Inc. and operate according to the established bylaws and guidelines. Chapters of Distinction support, to the extent possible, those initiatives put forth by the FVSUNAA, Inc. Board of Directors. Chapters of Distinction are actively involved in such areas as student support and interaction, networking, community service, membership support, alumni and student recruitment, communications, alumni and student engagement, and infrastructure enhancements. Chapters of Distinction should show an increase in membership through recruitment of new members and retention of current members. Ideally, the increase in membership should be at least 10% from the total of members from the previous year end. To qualify for the Chapters of Distinction Awards, please provide information to support the criteria.